Explanation: Did you see that flash? Lasting only about 15 seconds, it's possible that nobody you ask can confirm it, but what you might have seen is sunlight reflecting off an orbiting Iridium satellite. Satellites of all types have been providing streaks and glints visible only since the launch of Sputnik I in 1957. Of these, flares from any of the 66 Iridium satellites can be particularly bright, sometimes even approaching the brightness of the Moon. 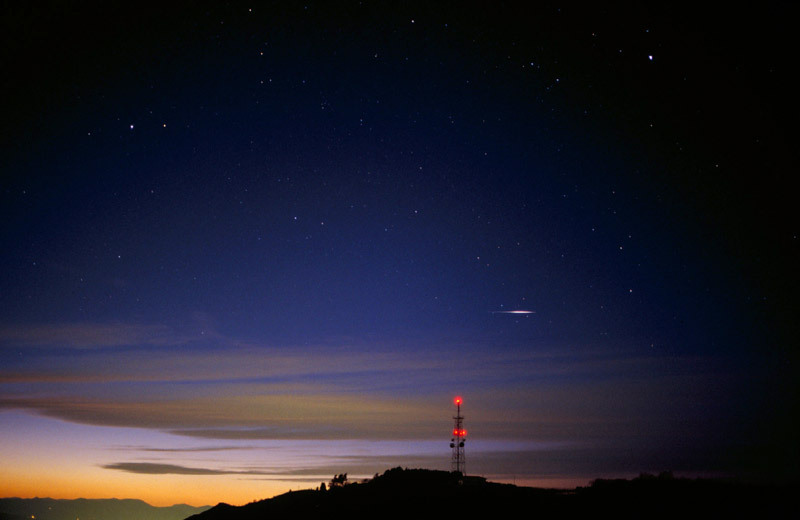 If the Iridium satellites are programmed to re-enter the Earth's atmosphere, they might provide even brighter flares as they burn up. Pictured above, the streak from an Iridium satellite punctuates a picturesque sunset in San Sebastian, Spain. Then again, that sky-flash you saw? If it lasted only a second or two, it might have been a meteor.